In 1956, the discovery of a Roman countryside villa was unearthed alongside the road to Weiler Kreut, parallel to what is now the B17 neu federal highway. This existed from the beginning of the 2nd century until the middle of the 4th century AD. The site is part of a group of large villas belonging to the former province of Raetia. It is situated on the junction of the former Roman Kaiserstaße Via Claudia Augusta, which runs on the opposite side of the Lech river, and the connecting road to the Brenner. The Villa Rustica of Peiting is one of Germany’s rare atrium buildings, which instead of the usual corners risalits, features two apsides. Hypocaust heating systems in the main building and bath house, remains of mural paintings, glass windows and terra sigillata discoveries provide evidence of the building’s high standard of living. Besides the rarity of the type of building, a small inscribed plumb panel was found on both sides, bricked into the foundation walls. The panel displays what is presumed to be a spell of love, which a certain clement had written and addressed to a woman by the name of Gemella. A find like no other to date, which still to this day has not been fully decrypted. 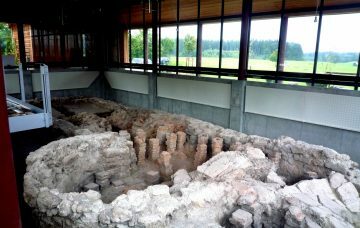 The remains of the bath house, which were exposed again between 2000 and 2004, can be found under a fully glazed protective enclosure. Information boards explain the construction. 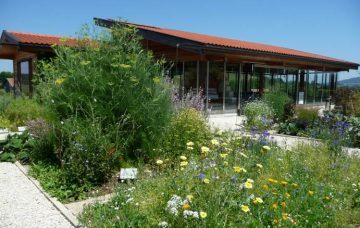 A Roman culinary and medicinal herb teaching garden surrounds the enclosure.